Welcome to the Themeco Community (aka Apex). In this guide, you'll learn where everything is and what you need to know about navigating around your Themeco account. Let's start! It may seem overwhelming at first, but fret not! We'll go through it step by step. First up on your dashboard, you'll notice that there is always the latest versions of X, Pro and Cornerstone available to download. Clicking those download buttons will download the latest zip. You'll only see the downloads for products that you've purchased. Where you see Last Updated that date is a link. 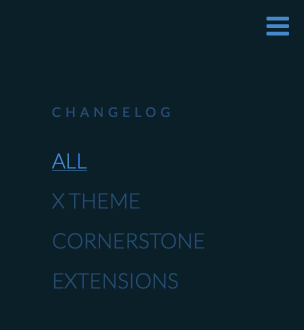 Clicking the link will take you to the changelog entry for that product. 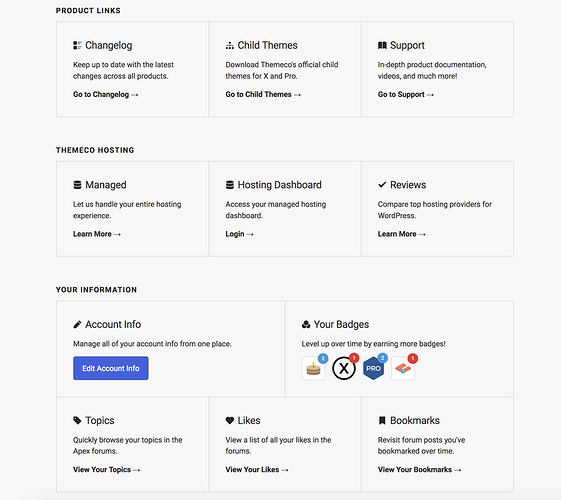 Scroll further down your dashboard and you'll see the Product Links, Themeco Hosting and Your Information sections. We'll be exploring some of these links in further details later on in the article, though many of them are self explanatory. The Themeco Knowledge Base is the place to go if you want to learn how to use an aspect of the theme or are having an issue with a detailed questions and answers section along with articles covering everything from the initial setup through to customizing CSS. Troubleshooting guides and more. Once you're on the forum, you'll see one button for a new topic. A member of our dedicated support team will get back to you as soon as possible. Response times are up to 24 hours Monday-Friday and may take longer on weekends or for complex issues. Support Forum - Product support. 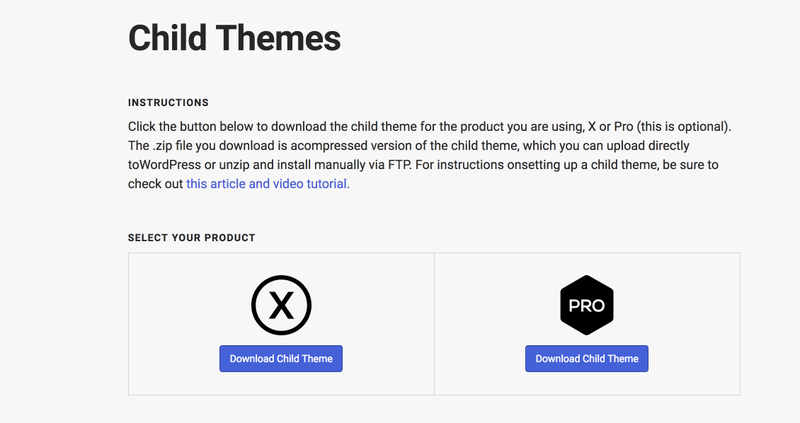 News - Important news about Themeco products. 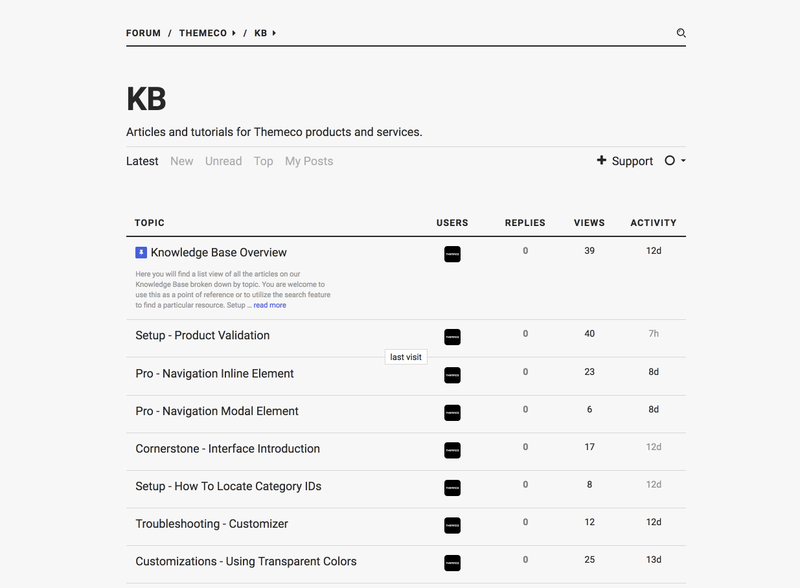 Knowledge Base - Articles and tutorials about Themeco products and extensions. Peer to Peer - Conversation about Themeco products only that you don't require support on. General - General forum for discussion about any design, development, hosting, optimization, marketing talk that isn't about a Themeco product. 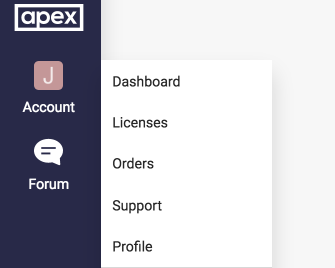 From here you can quickly navigate to your licenses, orders, support, the main dashboard and your profile. 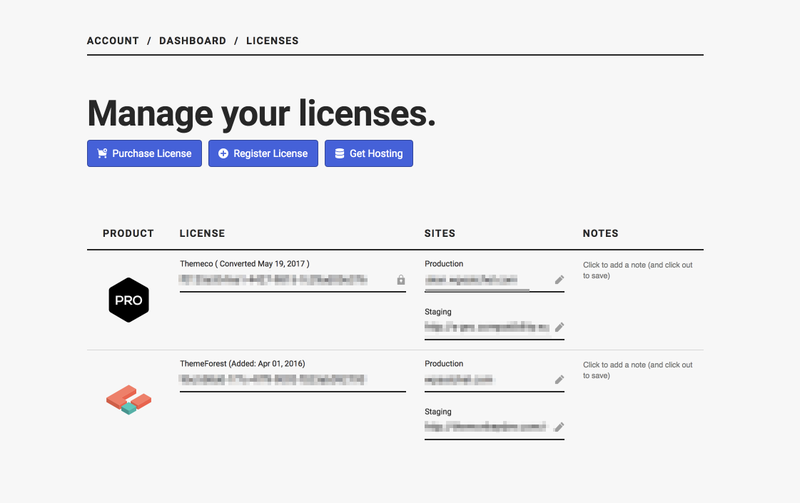 Here you can manage which sites are assigned to your licenses and verify new licenses. To learn more about license management and product validation take a look at our knowledge base article here.